FDAAWARE has developed the ONLY cloud based risk management platform fully integrated with FDA FOIA gathering compliance intelligence to reduce likelihood/severity of 483. We have inspections information conducted for the past 10 years; the most comprehensive 483s / Recall / Warning Letters / EIR database in the industry. (Over 40,000 inspection records, more than 18,000 483s Records, 16,000 Recalls and more than 2,000 FDA Inspectors statistic). FDAAWARE is using a unique algorithm, combined with your inputs to identify potential risk areas; we will help you significantly reduce your compliance risk, and better prepare your team for an upcoming inspection. FDAAWARE ENABLES COMPNANIES TO MINIMIZE COMPLIANCE RISKS AND MANAGE IT END TO END. 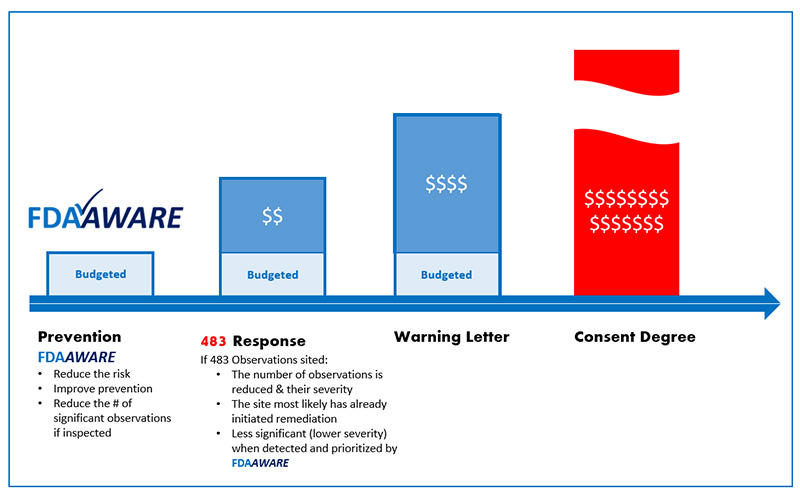 FDAAWARE enables its users to, project their compliance risks by leveraging current and historical 483s, recalls and warning letters. Fully integrated risk management platform with FDA CFRs for Drugs, Biologics and Devices to effectively manage the compliance risk with limited resources. Built-in Project Management module to optimize compliance mitigation efforts and full transparency.